As the end of the year approaches, Google and Facebook advertising solution are seeing harmony that has never been reached before to an extend that makes one asks, are they teaming up or at least having a common vision for 2015? Facebook has announced their new secret weapon and it has been a major game changer in 2014, Kenshoo recently did a study and found that combining search and facebook resulted in 30% increase in return on adspend. Facebook wants to capitalise and build upon the success and investment that advertisers are doing in Google search campaigns. Search is always a great way to start a digital campaign. It helps the business owners find out how people are searching for their business and what their needs are. Remarketing through Google display network has always been a very important companion to a successful search campaign as it helps increasing the ROI and dropping the cost per acquisition. Facebook uses the audience that is acquired through Google search as a building block, through their website custom audiences feature they have the ability to find existing customers and target them with a special message. This is a valuable feature as it helps further increase ROI and reduce CPA. Facebook can reach over 50% of the users driven by Google through their tracking pixel. Let’s face it, driving user registration to SMB websites is not an easy job, building Google / FB audience are more feasible and cost effective alternatives for marketers. Ultimately, growing these lists could be done through using look alike audience feature that both platforms provide. 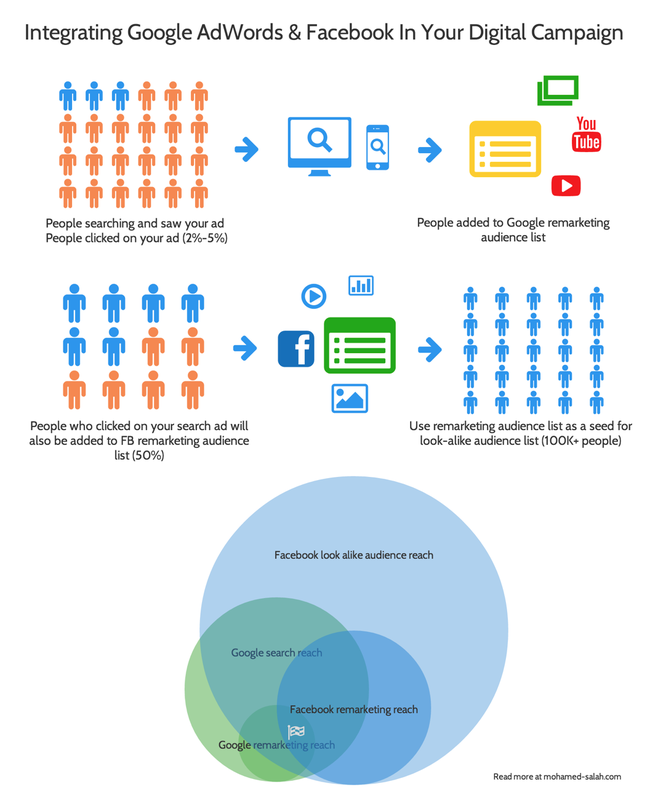 Here is an infographic that i created to show the level of connection today between Google AdWords and Facebook Ads. Except to see better harmony in 2015.